Gaspacho is a term that means, simply, a soup made of uncooked vegetables. The choices and combinations are endless. In fact, fruit “gaspachos” are making their way onto restaurant menus and family dinner tables. Some gaspachos are delivered with meaty chunks of vegetables floating in vegetable juice, while others are blended or processed to a chunky or smooth puree. This is a pureed version, made rich and creamy with a handful of sliced blanched almonds that have been toasted to draw out the nuttiness. 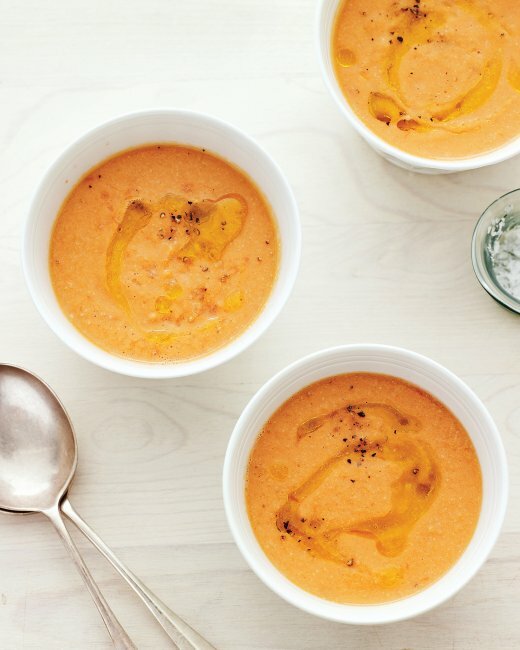 It’s a lovely variation on traditional gaspacho and is certain to become a favorite. Adapted from Martha Stewart. Adrienne demoed this at Brookside July 16 and US Botanic Garden July 17, 2014. Puree tomatoes, cucumber, onion, garlic, almonds, vinegar, oil, and salt in a blender until smooth; add enough water to get the right consistency, not too thick. Refrigerate two hours. Drizzle with oil, and season with salt and pepper just before serving. This entry was posted in Recipes from Adrienne's pantry, Soups, Vegetarian. Bookmark the permalink.